Tex-Mex at its finest! Call in the vaqueros and treat them to this ranch favorite. Preheat the grill to 450 °F. Mix the Beef Base, oil, oregano, cumin, pepper, garlic, and cilantro in a small mixing bowl. 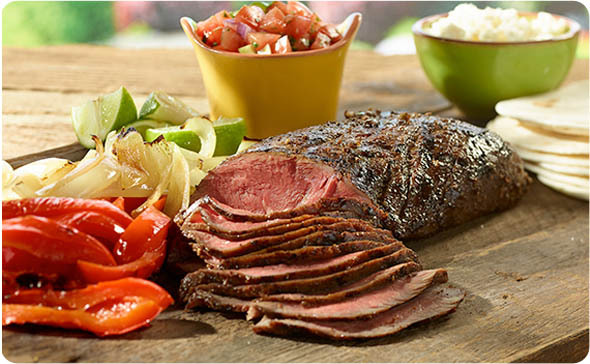 Rub half the marinade over the flat iron steak and refrigerate covered for 2 hours and up to 8 hours. Add the vegetables to the remaining marinade and refrigerate. Remove the steak from the marinade and place directly onto the grill. Grill for 4 - 5 minutes per side. Remove the steak from the grill and place on cutting board. Let rest for 5 minutes. Add the peppers and onions to the grill. Grill for 2-3 minutes per side. Remove the vegetables from the grill and chop into 1” pieces. Slice the steak thinly and serve with the grilled vegetables.